I will be doing a 20 minute talk on this day....around 10:30a. Come in and bring friends....there is a cafe: Superfoods Cafe and the Divine Boutique Gift Store. All in picturesque downtown historic Medford. Good Vibrations: Your Energy, Your Body, Your Life! If you have a physical, emotional or mental challenge---this will broaden your perspective and open up more options for healing! If you are interested in why energy healing works. 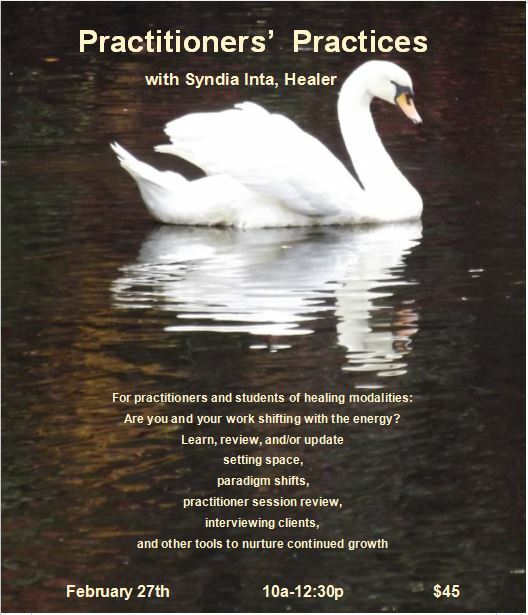 If you are a student of any healing modality and would like more information to add to your skills. Make an appointment or two, or meet your friends and spend the day visiting and tuning in. Coffee, tea and light refreshments will be provided. Free talks every 20 minutes on the half hour. ~ The fair is offering different avenues to healing. 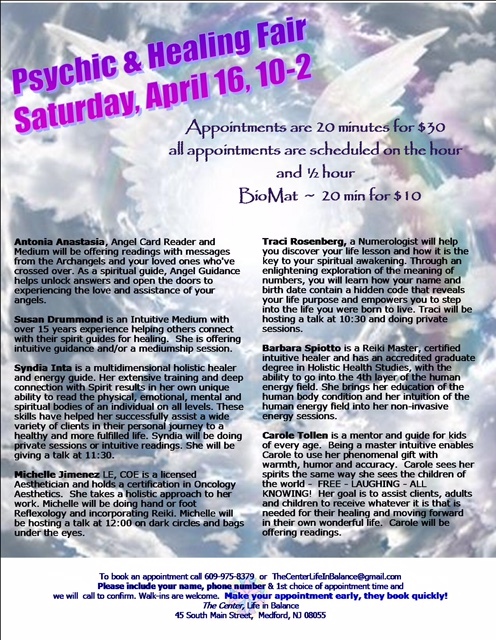 Those new to alternative healing will have an opportunity to try one or more healing modalities and listen to free talks. Guests will be able to have an intuitive/psychic reading, a Reiki Session, an energetic healing session and/or lie on the BioMat. 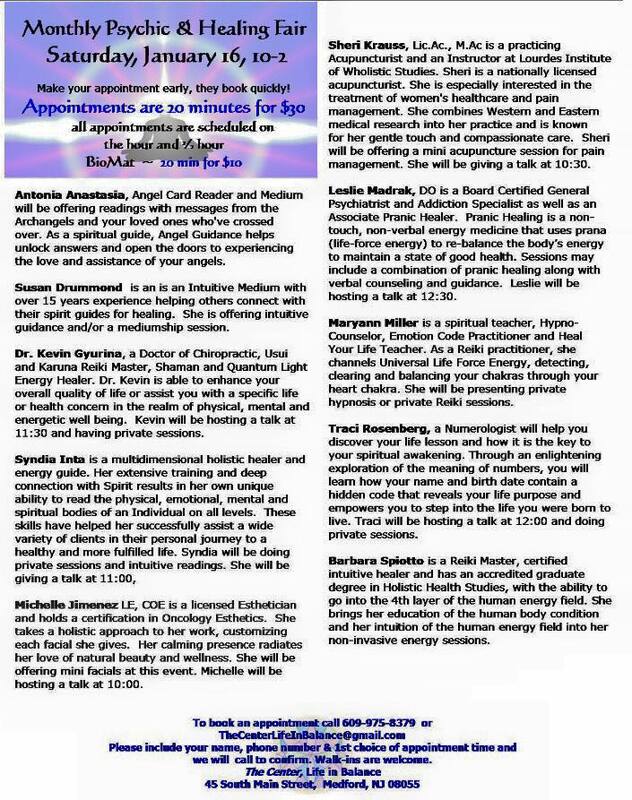 All readings and private sessions are scheduled for 20 minutes for $30. The full BioMat and the MiniMat will be available for 20 minutes/$10. The BioMat incorporates amethyst crystals, far infrared heat and negative ions to help the body heal and relax. All appointments and free talks are scheduled on the hour and half hour. Walk-ins are welcome and encouraged. 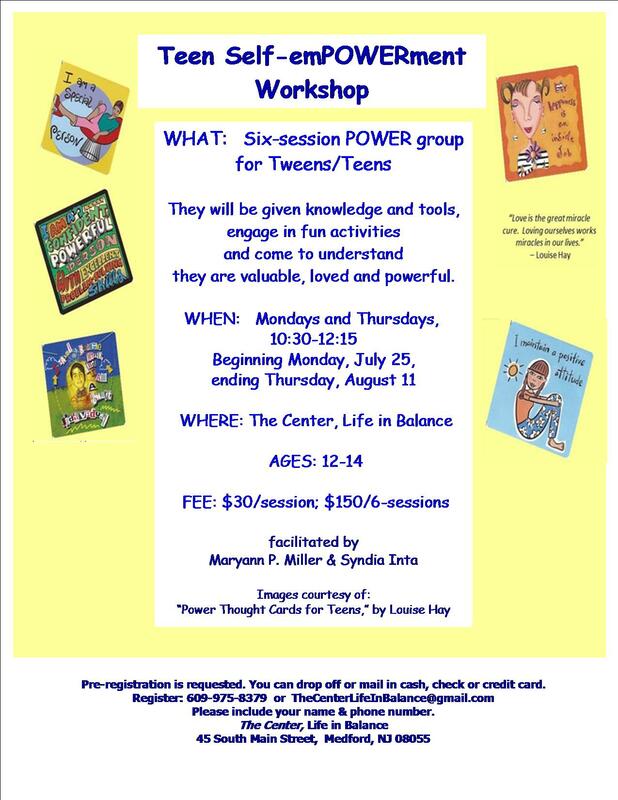 Register: TheCenterLifeInBalance@gmail.com or 609.975.8379 with your name and phone number. Call 609-975-8379 to schedule and get a list of available practitioners and their area of expertise! 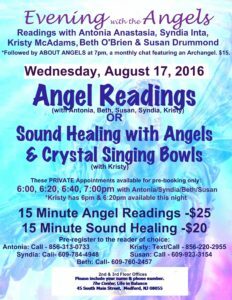 Syndia Inta will be available for intuitive readings and multidimensional healing sessions. See the attached flyer for participating practitioners. Call ahead to make an appointment, 20 minutes for $30. Walk-ins are welcome. Bring a friend, listen to the great talks going on all day - they are FREE! And of course grab some delicious healthy food from SuperFoods Café! Make an appointment or two, or meet your friends and spend the day visiting and tuning in. Coffee, tea and light refreshments will be provided. Free talks every 20 minutes on the half hour. 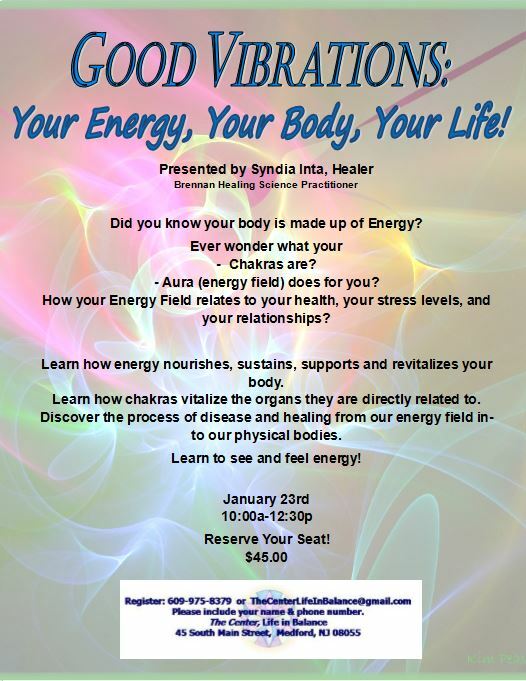 Syndia Inta will be giving a 20 minute talk on how our energetic anatomy relates directly to our physical bodies--the true mind/body connection! Knowledge, tools, fun activities, and come to understand they are valuable, loved and powerful.